Standard model with built-in illumination, for quick and easy observation using 20x magnification. It can be easily adjusted for vision differences between the left and right eye. The wide range of focus available makes observation of three-dimensional objects easy. 3. 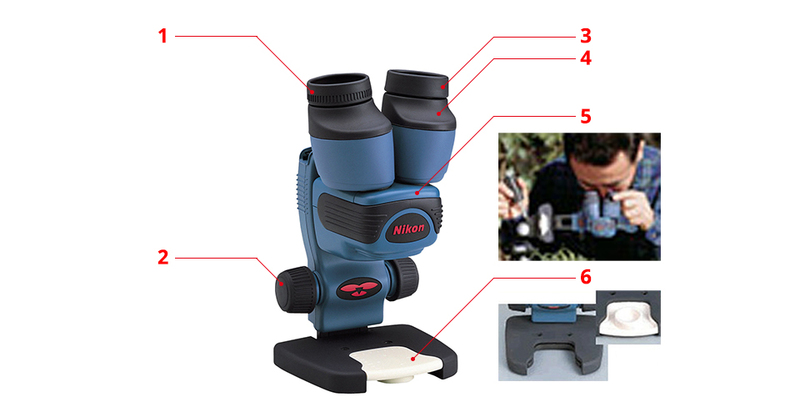 Magnifies objects 20 times with a three-dimensional effect, thanks to the stereoscopic binocular design. The platform can be fixed to a tripod and the head rotated so that any angle can be freely chosen for observation. The head can be rotated 180˚ to make the unit compact and easy to carry. 6. Both the top and the underside of the multifunctional standard stage plate can be used, or the plate can be removed entirely.